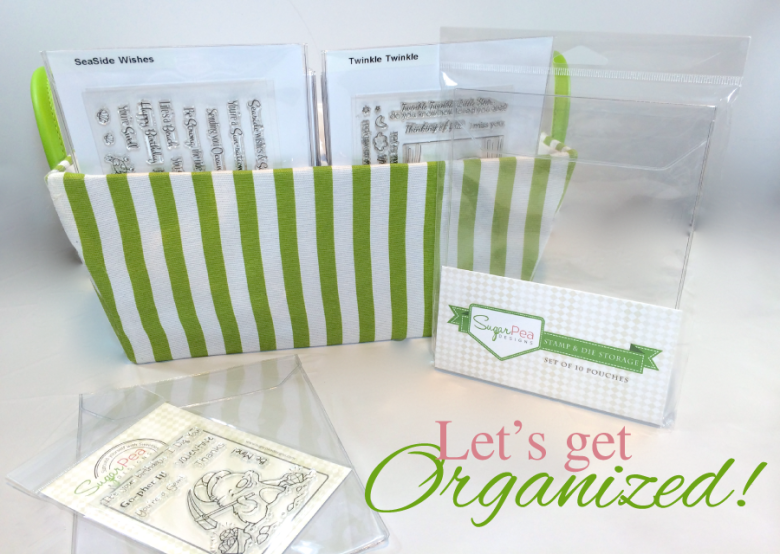 Are you ready for a brand-new Sugar Pea Designs RELEASE?! This sweet new stamp set, Teacher's Pet from the Bean Stalk Collection is definitely a favorite of mine! When you're a teacher, you really have no choice, but to love all things school-themed! LOL! Would you like to WIN the Teacher's Pet stamp set?! 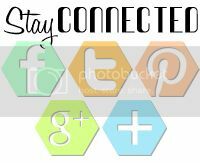 Hop along and visit with the SugarPeas and guests, leaving some comment love along the way! One lucky person will be randomly selected to win the Teacher's Pet stamp set! Here's a look at this awesome new stamp set!!! These two challenges inspired me even more to create a fun school-themed card...Sketch Saturday #326 and Cupcake Inspirations Challenge #277: Apple for the Teacher! I stamped Mr. Teddy and the mini school bus over some patterned paper from Echo Park's Paper & Glue collection, die cut a Reverse Confetti apple and some notebook edged paper, then layered it all up for a whimsical card! To finish off these sweetness, I sprinkled a few Pretty Pink Posh sequins here and there, too! 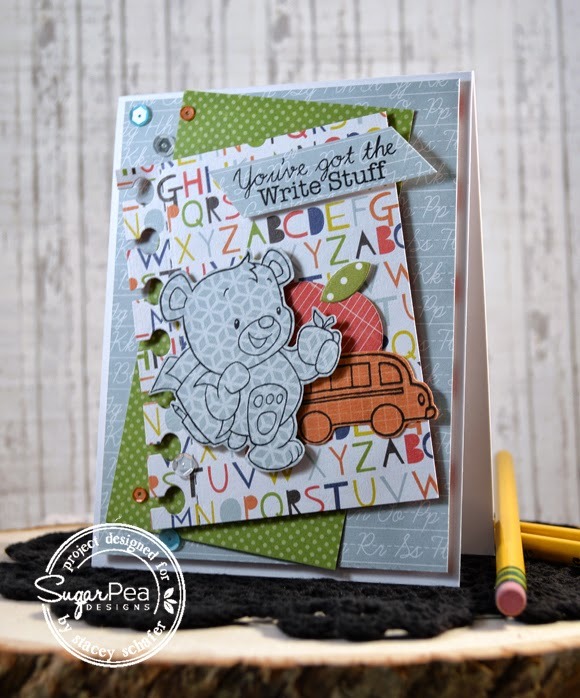 Now, you are off to see what the Sugar Pea Designers whipped up using the new Teacher's Pet stamp set today! So super cute! I love how you layered all of those great patterned papers together! Your cards are an inspiration for every non-colorer out there who fears line art!! Love this! I could sit and look at this card ALL day!! It is precious and perfect in every way!! I love all the paper piecing, too cute! Oh my goodness, how CUTE is this!? I love seeing all the variations of this cute teddy! super cute paper pieced card! the coloring is very nice. Very cute images and I like how you stamped on pp and fussy cut them out. Great use of the patterned paper on your sweet card! CUTE! The patterned papers on your images are such a great idea. It really gives a unique look. Love the paper piecing!!! Amazing card!!! so beautiful, Stacey, I love the paper piecing!! Super cute Stacey. I love how you layered the school bus in there too. Cool card! Love the colors and design! This is totally adorbs! Love it! That sentiment is awesome! I like this card a ton. The bear, bus and apple cut out from patterned paper. I've never tried this look before and I hope I do very soon. Thanks for the inspiration. Very fun. I like the paper piecing. I love how you stamp the image on pattern paper and how you use the papers, so awesome! Fun image and super cute card. Love all the layers. I love paper piecing and you rocked it!! So, so, so cute!! Way to go - this really is awesome!! I love this little bear! This is such a fun school card!! 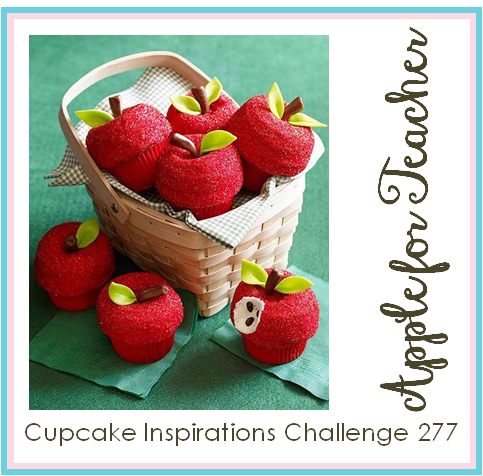 So glad you were inspired by this week's Apple for Teacher Challenge at Cupcake Inspirations! This is adorable, Stacey! Thanks for joining us for Sketch Saturday this week!